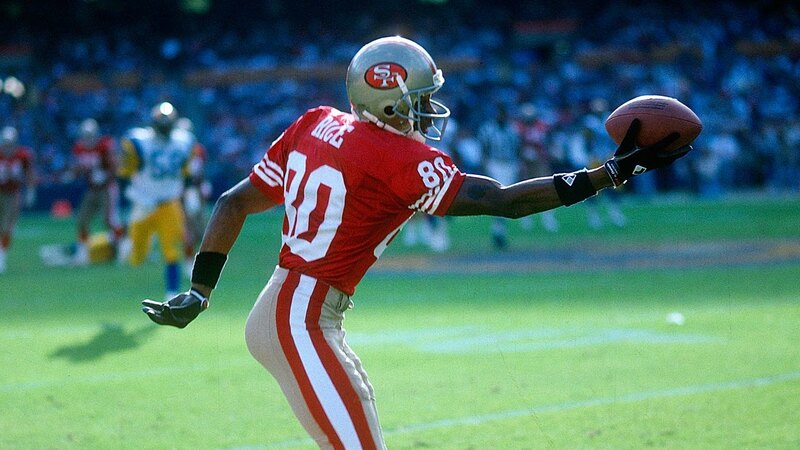 NFL Hall of Famer, Jerry Rice is a three-time Super Bowl champion. Rice is arguably the greatest player of all time. During his 15-year career with the San Francisco 49ers, Rice won three Super Bowls: Super Bowl XXIII (’88), Super Bowl XXIV (’89) and SB XXIX (’94) and one Super Bowl MVP. He enjoyed three seasons with the Oakland Raiders, including a Super Bowl appearance and one season with the Seattle Seahawks before retiring in 2005. Rice was elected into the Pro Football Hall of Fame in January 2010, his first year of eligibility. During his career, Rice was selected to the Pro Bowl a record 13 times, won the NFL Most Valuable Player Award in 1987 and was Super Bowl MVP in Super Bowl XXIII. In 1999, he was ranked No. 2 in The Sporting News’ list of 100 Greatest Football Players — the highest ranked active player and receiver — and in 2010, was voted the No. 1 player in the NFL Network’s The Top 100: NFL’s Greatest Players. Rice resides in the San Francisco Bay Area and has four children. As a 49ers fan it was such an honor to chat with Jerry about football, fatherhood, and so much more. Art Eddy: In sports everyone loves to debate who is the best athlete in any position except when it comes to the wide receiver position in the NFL. By far you are considered to be the best with good reason. From your work ethic to the many records you still hold in the NFL. When you started out back in 1985 with the 49ers did you think that you would have this type of career? Joe Montana, Ronnie Lott, Roger Craig, and all of these great players. I was a little bit intimidated when I first came in because they had so many great legends. Then I thought of everything that I had done playing football in high school and at the collegiate level. I worked. That is all I did. I just worked harder than anyone else. I brought that to the San Francisco 49ers. It was very successful for me. I thought it put me on a whole new map. All of a sudden you have this young kid who is catching a five yard slant and he is running for 95 yards. It became contagious. All of the players started doing the same thing. Even if the ball was not going their way you had guys down field making a block to get their teammate into the end zone. It was all about my work ethic and my practice habits. I had so many great football players around me. Everything just took off. I had to pinch myself. I couldn’t believe what had happened. I just give credit to all my teammates and working hard. I never wanted to let anyone down include the fans out here in San Francisco, my parents back home, and everyone that has supported me. That drove me to not get complacent and continue to work hard. AE: You played with two Hall of Fame quarterbacks in Joe Montana and Steve Young. I am guessing as a wide receiver you felt blessed having those two lead the offense. On the flipside Joe and Steve were very thankful to have you as a wide receiver. What was it like to play with both of those guys? I joke and say that I put both of those guys into the Hall of Fame. Those are two that came to work every day. They are total professionals. Joe was not known for having the strongest arm, but if it was a three step drop or a five step drop the ball would be out of his hands. I am down the field and running my route and the ball is already in the air. It is almost like you are doing a dance. Repetition wise you have done this over and over. For the fans in the stands you are like what is happening here. How can this time out the way it did? The west coast offense is all about timing. So the ball was always out of Joe’s hands. Steve when he took over he was more of a running quarterback. He had a different spin on the ball because he was a lefty. I had to adjust that. Steve wanted to become more a pocket passer. We were able to go on and put out some outstanding numbers. These guys were such professionals. It started at practice. We had done all of those incredible plays and we had built that chemistry. Now we were able to take it to the field where the fans can enjoy. They would leave the stadium and go home and talk about it. I could now brake a couple tackles and go the distance. It was all about preparation. They were two great guys that loved the game of football. They were leaders on and off the football field. AE: Is there one accolade or award that stands out above the others? JR: The funny thing is no, not at all. I got a chance to touch so many people whether they were in the stadium or at home running along with me near the TV. All the records I don’t take for granted. I never played for the records because I loved the game of football. If you know me you could see it on the football field by the way I loved the game and the way I played the game. I give all the credit to my teammates. There is not just one that stands out in particular. 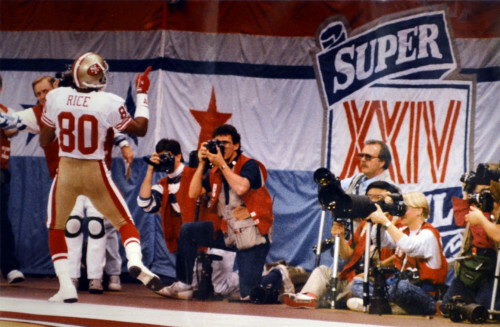 I think playing on the big stage, the Super Bowls I just loved it from day one. I still love it. I wish I could go back and start all over again and play this game that I really love. AE: You played in a time during the league where the defense could rough the receivers up. Now the league is more geared toward the offense. Do you think you could beat your records if you played in the league now? It was incredible and I wouldn’t go back and change anything. Being able to play it for such a long time and knowing that my opponent game planned for me not to be successful on the football field. Do everything possible to stop me from making big plays. Because of my preparation and my teammates and the way we practiced I was able to do some outstanding things on the football field. AE: Switching to fatherhood now, what are some of the core values you looked to instill in your kids as they grow up? JR: Work hard. There are no short cuts. Just love what you do. Those are some of the things that I value. Even though my football career is over I still apply that to all my endeavors. Whatever I do I give 100 percent. You are going to get the best out of me. I am not going to try and be someone else. I am going to be myself. My parents instilled that into me. Not letting any obstacles stand in your way. Keep pushing forward and always give 100 percent. AE: What were the first few thoughts that you had when you found out you were going to be a father? JR: Oh my gosh! (Both laugh.) I was excited to be a dad for the first time. You bring someone into this world and it is a part of you. You are excited about taking care of that person and raising the person the right way. Instill in them what your parents instilled in you. It is scary because you know how cruel this world can be. I was a bit skeptical about that and some of the obstacles that they will face in their life. That is just part of living. You learn from mistakes and you grow. I got great kids. They work hard. Their dad can still give them that Mississippi look and they know that they better get their act together. (Both laugh.) That is something we have down south. I have great kids. They work hard. I was very, very excited about brining my first one in. Then my second one and so on. It is a joy. JR: You have to work together as a team. The team concept works in so many areas. In football it was one of those things that if you didn’t work together as a team there is no way that you could reach that ultimate goal. I think it is the same thing when you are a parent. Just enjoy your kids while they are young because they grow up real fast. You will look at a picture and say, ‘Oh my God, what happened? What happened to the time?’ They become teenagers and adults so you just have to enjoy the terrible twos and all of that stuff. Know that they are going to do something special in life. You just have to enjoy those times. They are very precious because they do grow up and they grow up fast. AE: What is your favorite family movie? JR: I would say around the Christmas, it would be The Grinch. That is so Christmas. Favorite movies for me are The Gladiator with Russell Crowe and The Revenant with Leonardo DiCaprio. AE: What is your favorite song to dance to as a family? Too Short. When they start playing that song I start dancing. My kids always get on me about that, but they all get involved too. It is a family thing. They know that their dad still has rhythm. I can still get down with the kids. I love music. There are certain artists that I like. JR: We used to go to Hawaii a lot. It was for the Pro Bowl, but my kids always looked forward to that. It was special to them. They got a chance to relax and be around other players and kids. So that was real special. It is a little bit different now because I feel like we have been isolated so much in Hawaii. Before we were downtown in Waikiki where everything was happening. Then all the fans had access to you. Now things are a bit more isolated. AE: Out of your three Super Bowls do you have a favorite one? JR: The first one I really didn’t know what was going to happen. I didn’t know how I was going to react. The second one I had a better feel for what was going to happen. For the third one you don’t get comfortable. You don’t feel like it is a sure win. There are some nerves going on because you think of the scenario of not winning it. If I had to pick one it would probably be Super Bowl XXIII on that final drive. Everything came down to that one possession. To be able to move the ball down field and not make a mistake and win the Super Bowl the way we did. I was watching it last night. Even though I played in the game I could feel what the fans were going through. To be able to do that under that type of pressure on that final drive when everything was on the line. One mistake the ball game is over. You lose the Super Bowl. That is something that I will never forget. AE: What was the first thing that popped into your mind when you got the call that you were going into the Pro Football Hall of Fame? JR: The first thing was that I cried like a baby. It was the same scenario when I was playing collegiate football. They said that I was going to get drafted. You are going to play professional football. I never thought I was going to get that dream. I never thought that I was going to get into the Pro Football Hall of Fame, but people were saying that. I never take anything for granted. I was like this was unreal. To play professional football and have your peers recognize you and put you into the Pro Football Hall of Fame. This is an elite group of guys. That was the icing on the cake. Go to jerryricefootball.com and @JerryRice on Twitter.